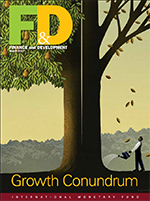 “Growth Conundrum” sets the theme for the many fascinating articles in the latest issue of the IMF’s quarterly magazine Finance and Development which includes an opening essay by Nicholas Crafts and a profile of Kristin Forbes. I was asked to write one of the articles summarizing my recent research on the recent slow growth in which I have been critical of the secular stagnation view. In this post I reprint that article, but also add references to articles and papers by me and others providing relevant background and support, which I could not put in the published article due to understandable space constraints. The article is one part of a two-part “Point-Counterpoint: Secular Stagnation” in which Brad DeLong takes the other side. Brad has already responded to my article on his blog, but he apparently did not have the benefit of these references and he was completely off point in his counter point to the magazine’s point-counter point. edited by Matin Baily and me, and is based on the October 2013 Brookings-Hoover conference where Larry first presented the idea. My chapter in the same conference volume includes an early critique of secular stagnation. Speaking at a recent conference, Summers posited that for the past decade and a half, the economy had been constrained by a “substantial increase in the propensity to save and a substantial reduction in the propensity to spend and invest,” which were keeping equilibrium interest rates and economic growth low. See page 44, Chapter 2, of the Baily-Taylor volume from the same conference. Few dispute that the economy has grown slowly in recent years, especially when the financial crisis is taken into account. But secular stagnation as an explanation for this phenomenon raises inconsistencies and doubts. Low policy interest rates set by monetary authorities, such as the US Federal Reserve, before the financial crisis were associated with a boom characterized by rising inflation and declining unemployment—not by the slack economic conditions and high unemployment of secular stagnation. I summarized the facts in a January 2014 Wall Street Journal article The economic hokum of ‘secular stagnation‘ saying that “There were boom-like conditions, especially in residential investment, as demand for homes skyrocketed and housing price inflation jumped from around 7% per year from 2002-03 to near 14% in 2004-05 before busting in 2006-07. The unemployment rate got as low as 4.4%—well below the normal rate and not a sign of slack. Inflation was rising, not falling. 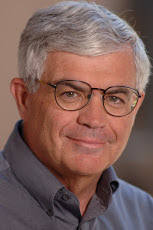 During the years 2003-05, when the Fed’s interest rate was too low, the annual inflation rate for the GDP price index doubled to 3.4% from 1.7%.” The evidence runs contrary to the view that the equilibrium real interest rate—that is, the real rate of return required to keep the economy’s output equal to potential output—was low prior to the crisis. And the fact that central banks have chosen low policy rates since the crisis casts doubt on the notion that the equilibrium real interest rate just happened to be low. Here I refer to the empirical work in my 2016 Business Economics article with Volker Wieland Finding the Equilibrium Real Interest Rate in a Fog of Policy Deviations in which we explain how monetary policy decisions to chose low rates confound methods to determine the equilibrium rate Indeed, in recent months, long-term interest rates have increased with expectations of normalization of monetary policy. The 10-year Treasury has increased from 1.2% to 2.4% since last July. For a number of years going back to the financial crisis, I and others have seen a more plausible reason for the poor economic growth—namely, the recent shift in government economic policy. References to research by Lee Ohanian, John Cochrane, Steve Davis, me and others are found in my 2016 AER paper “Can We Restart the Recovery All Over Again.” Consider the growth in productivity (output per hour worked), which along with employment growth is the driver of economic growth. Productivity growth is depressingly low now—actually negative for the past four quarters. But there is nothing secular about this. Indeed, there have been huge swings in productivity in the past: the slump of the 1970s, the rebound of the 1980s and 1990s, and the current decline. These shifts are closely related to changes in economic policy—mainly supply-side or structural policies: in other words, those that raise the economy’s productive potential and its ability to produce. During the 1980s and 1990s, tax reform, regulatory reform, monetary reform, and budget reform proved successful at boosting productivity growth in the United States. In contrast, the stagnation of the 1970s and recent years is associated with a departure from tax reform principles, such as low marginal tax rates with a broad base, and with increased regulations, as well as with erratic fiscal and monetary policy. During the past 50 years, structural policy and economic performance have swung back and forth together in a marked policy-performance cycle. Evidence for these swings in productivity growth and policy is presented in my 2016 AER paper as well as in the paper Slow Economic Growth as a Phase in a Policy Performance Cycle” published in the 2016 Journal of Policy Modeling. To see the great potential for a change in policy now, consider the most recent swing in productivity growth: from 2011 to 2015 productivity grew only 0.4 percent a year compared with 3.0 percent from 1996 to 2005. Why the recent slowdown? Growth accounting points to insufficient investment—amazingly, capital per worker declined at a 0.2 percent a year clip from 2011 to 2015 compared with a 1.2 percent a year increase from 1996 to 2005—and to a decline in the application of new ideas, or total factor productivity, which was only 0.6 percent during 2011–15 compared with 1.8 percent during 1996–2005. To reverse this trend and reap the benefits of a large boost to growth, the United States needs another dose of structural reform—including regulatory, tax, budget, and monetary—to provide incentives to increase capital investment and bring new ideas into practice. 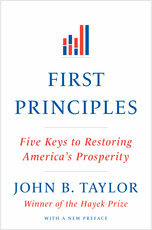 These reforms are described in my 2012 book First Principles. Such reforms would also help increase labor force participation and thus raise employment, further boosting economic growth. While the view that policy is the problem stands up to the secular stagnation view, the ongoing debate suggests a need for more empirical work. The recent US election has raised the chances for tax, regulatory, monetary, and perhaps even budget reform, so there is hope for yet another convincing swing in the policy-performance cycle to add to the empirical database. This will depend on whether the slew of reform proposals in the Congress and the Administration are passed and implemented, as discussed in this Q and A with John Cochrane and me. If they are, then we will have more empirical evidence with which to test the hypothesis that policy has been the problem. This entry was posted in Regulatory Policy, Slow Recovery. Bookmark the permalink.